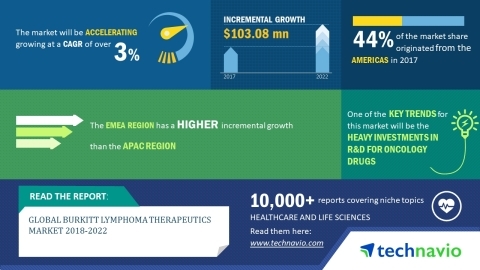 LONDON--(BUSINESS WIRE)-- The global Burkitt lymphoma therapeutics market 2018-2022 is expected to post a CAGR of close to 3% during the forecast period, according to the latest market research report by Technavio. A key factor driving the growth of the market is the rapid progression of Burkitt lymphoma therapeutics that requires medical attention. Burkitt lymphoma is recognized as one of the fastest growing tumors in humans and is highly fatal if left untreated during the early stages. The need for early treatment of Burkitt lymphoma is encouraging companies to invest heavily in R&D to develop therapies that are highly effective. This market research report on the global Burkitt lymphoma therapeutics market 2018-2022 also provides an analysis of the most important trends expected to impact the market outlook during the forecast period. Technavio classifies an emerging trend as a major factor that has the potential to significantly impact the market and contribute to its growth or decline. Large pharmaceutical companies such as Merck Sharp & Dohme, Novartis, Bristol Myers Squibb, F. Hoffman-La Roche, and Celgene, are constantly developing medicines for various cancer indications. The urgency of the treatment has resulted in the companies receiving support from USFDA, the EMA, and other regulatory bodies. “The oncology sector has been growing at a very fast pace and has seen an increase in the number of drugs approved each year. In 2016, USFDA approved 8 cancer medicines, while it approved a total of 18 medications in 2017. The major players in oncology sector have multiple drugs in Phase II and Phase III clinical trials for various indications of cancer, and the number of approvals is expected to grow in the coming years,” says a senior analyst at Technavio for research on infectious and rare diseases. This market research report segments the global Burkitt lymphoma therapeutics market by drug class (biological and small molecule) and geographical regions (APAC, EMEA, and the Americas). The Americas led the market in 2017 with a market share of more than 44%, followed by APAC and EMEA respectively. Despite the highest prevalence of disease in Africa, the Americas dominated the global Burkitt lymphoma therapeutics market in 2017 and is expected to retain its position.